Updated 11:00am 4/22/2015: Added NWSNashville’s HWO below. Summary: Very small chance of rain today. Thursday looks dry and a tad cool. Friday and Saturday look wet with a chance of severe weather. Today we are looking at a 30% chance of rain with a high temperature at about 70 degrees. The small chance of rain comes from a very weak cold front that will push through during the day today, setting of small chances of rain if any. It will be breeze with winds 10-15 mph out of the west northwest. Tonight there is a 20% chance of rain as temperatures fall to a cool 44 degrees. Thursday looks picture perfect, but slightly cooler. Thursday’s high will reach 64 degrees after Wednesday’s cold front moves through. High pressure moves in eliminating any chances of rain. Winds come out of the northeast at 5 to 10 mph under partly cloudy skies. Thursday night the temperature will fall to 44 degrees. Friday and Saturday is our next chance of severe weather. Unfortunately Thursday’s nice weather will be crushed by another chance of rain moving in for Friday and Saturday. Most of the daylight hours Friday will see little to no rain, with a high temp of 66 degrees. There is a 30% chance of rain during the day Friday. Friday night is when things start to change. Rain and storm chances increase to about 70% as the low pressure off to the west starting moving our way. 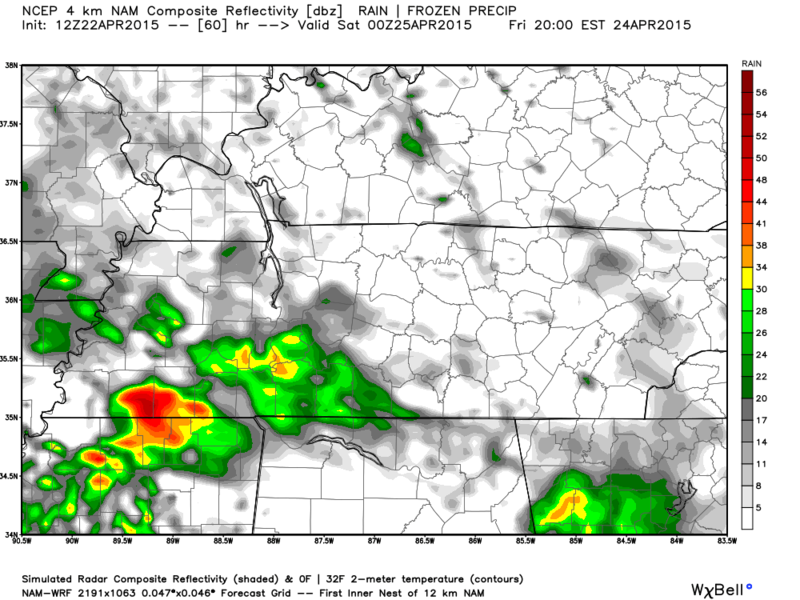 Here’s NAM4’s prediction of 7pm Friday night. Scattered showers and storms are expected overnight. Friday night, winds will turn out of the south pumping in warm, moist air ahead of a cold front. These are always ingredients for severe weather. 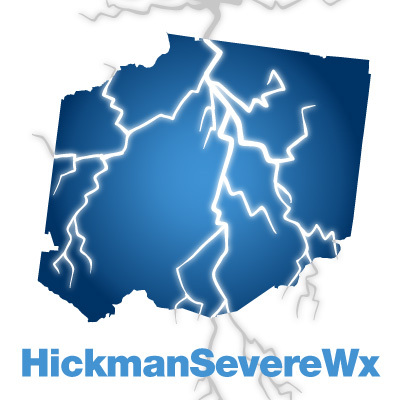 The SPC has already put Hickman County on the edge of a MARGINAL category of severe weather for 7am Friday to 7am Saturday. The low pressure off to our west will swoop in likely on Saturday. NIGHT AND SATURDAY ACROSS MIDDLE TENNESSEE. INTO SATURDAY...BRINGING WIDESPREAD SHOWERS AND THUNDERSTORMS. RAINFALL AND LOCALIZED FLOODING ARE ALSO POSSIBLE. Saturday we see a 60% chance of rain and storms as our high temp will be about 75 degrees. It’s too early to tell how big of a severe weather chance we are expecting Friday night into Saturday, but we will keep an eye on it. Any outdoor plans you have for late Friday and Saturday will be very wet, so make alternate plans or wet-weather-prep plans.